Shane, I have a question for you. My husband Art and I fondly remember seeing and hearing you speak to different groups we belong to in Apache Junction. So I am sure you can answer this. I have a memory of being told by someone back in those days that Thomas Jefferson used the phrase “pursuit of happiness” in the Declaration of Independence because he had a difficulty with using “property” due to landowners in the Southern states considering slaves as property. Now we have been watching Hillsdale College lectures, and hearing that he was expanding to “pursuit of happiness” so as to include both property and rights to religious and other freedoms. Could you say more about this? Thanks so much! My short answer is that I agree with the perspective of Hillsdale on this issue. Jefferson was expanding his definition of freedom by noting that the “pursuit of happiness” goes far beyond the simple possession of property. 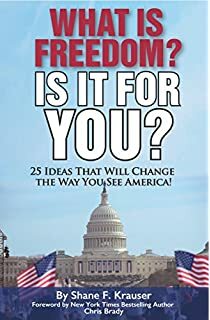 It had much less to do with the slavery issue (although that was critically important) and much more to do with a broader definition of freedom.